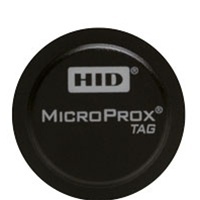 With the MicroProx Tag you can upgrade from magnetic stripe or barium ferrite technologies by simply adhering the Tag to your existing access card. Easily and cost-effectively turn a plastic ID badge or contact smartchip card into a proximity credential. Add proximity access control capability to users' cell phones, PDAs and other similar nonmetallic devices. Experience the convenience of proximity without the expense of rebadging. RF programmable, 125 kHz, customer specified numbers. Over 1.9x1025 unique codes available. two years from date of shipment.